For the first quick warp, you want to walk under the warp tile after picking up the rock, and then move ^> into the warp. You can pump a few times before hammering down the peg to gain a few frames. 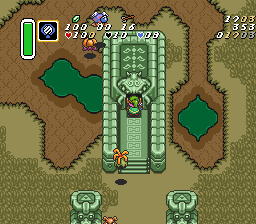 If you have Sword Beams and the top Octorok is in your way, killing it will reduce lag on the next screen on average, which ends up being faster overall (not to mention sparing its live can cause it to run into you). You can also attempt to walk <^ or ^ into the corner of the warp tile to potentially save a handful of frames. To get this quick warp you need to be 3-4 pixels away from the right side wall when you mirror. 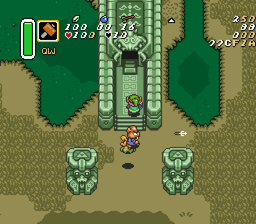 A good idea is to hold <^ briefly as you're moving up the stairs, and then using a pause buffer (switching from Hammer to Mirror) to confirm your position (Link's right ear position relative to the wall is a good visual cue to use here). Many runners opt not to go for the quick warp on their way out of the watergate (after pulling the lever) - in this case you want to mirror as close to the entrance as possible to minimize walking time. 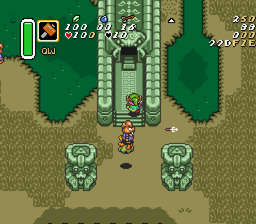 Otherwise you want to place the warp further away from the entrance to give you some time to move diagonally v> into the quick warp position (you need to move 4-5 pixels to the right to get the quick warp this time around). You pick up Hookshot in this segment. This page was last modified on 24 March 2018, at 04:54.